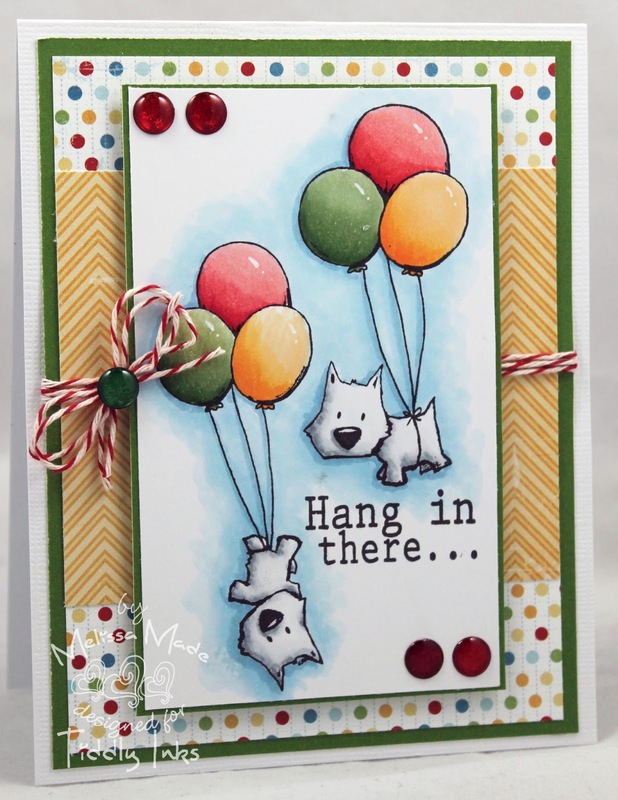 Melissa Made: Hang in there from Tiddly Inks! Hang in there from Tiddly Inks! That's not all, there are two more adorable images in clear and all of these can be found digital too right HERE! Hope to see you on the Challenge blog with your new stamps soon! aww too cute Melissa!! love the layout of your card hun, I have a tonne of rectangle cards sitting in a box that I don't use because they are side opening ones so I just know I will use this layout for some makes to get them used up!! Oh this is soo cute! I have a Westie called Roo, not too sure that she'd tolerate being tied to balloons!!! Love this cute card Melissa!! Too cute! Your coloring is fabulous! I love this stamp set and have added it to my "wish list". Oh my word! So super cute and fun! Adorable card Melissa! My favorite is the one hanging by his foot! Those images are so stinking cute! Your coloring and card look wonderful!